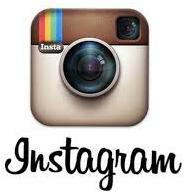 Feedback: 66 comments - leave yours! There is little doubt in my mind that making soba noodles by hand like Japanese chefs is one of the most spectacular cooking skills one can hope to learn in Japan. Not that I am so fond of these buckwheat noodles myself, I guess one needs to eat them a couple dozen times to start enjoying their delicate taste and brittle texture. But working with only 20% wheat content is like a culinary highwire act - there is almost no gluten to save you if you move the dough the wrong way. We are really dealing with the aristocracy of the noodles here. 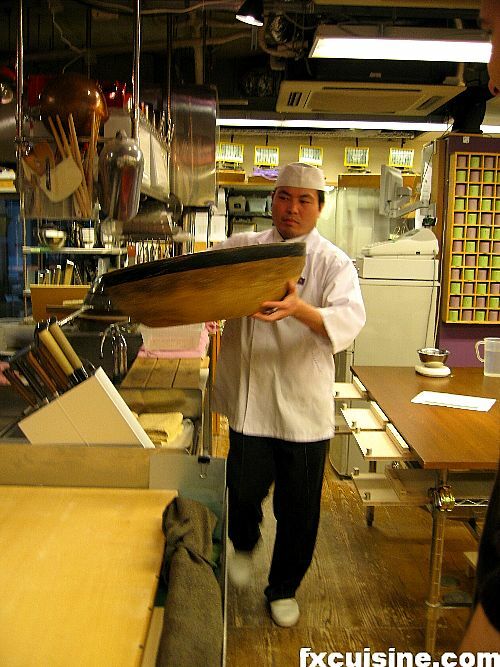 Another obvious perk is to work with the beautiful meter-long wooden rolling pin and to be allowed to touch the giant, guillotine-like soba knife. 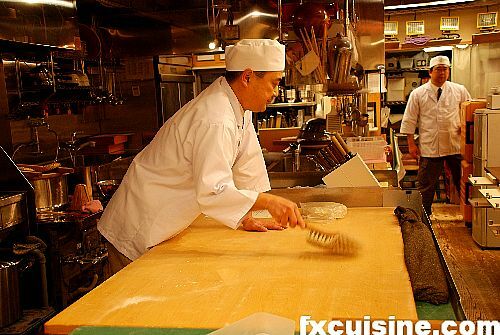 The technique used by Japanese chefs can be used, with some modifications, to make regular wheat-and-eggs pasta entirely by hand. As you see, it is much superior than the traditional Italian way. 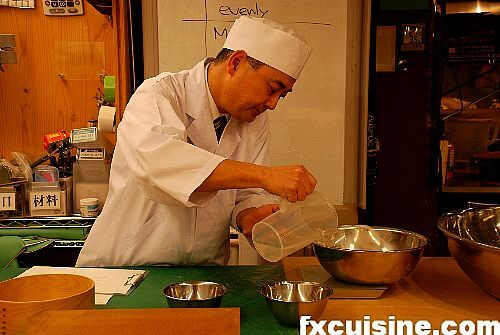 We arranged for a private class at the Tsukiji Soba Academy, a cookery school not far from Tokyo's wholesale fish market which trains Japanese soba chefs. 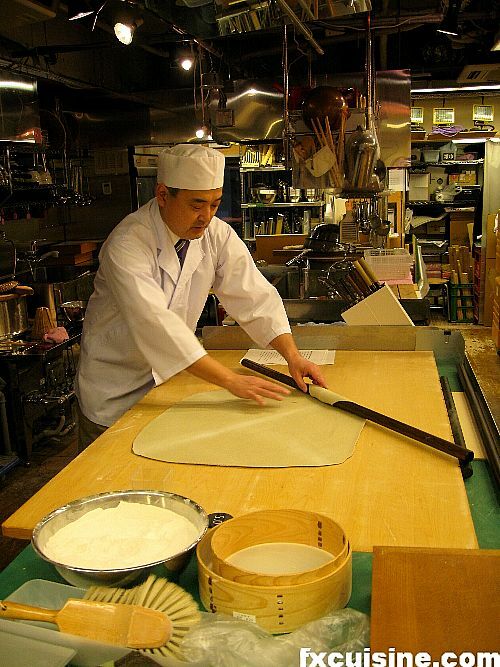 The cursus lasts about 30 days and after that alumni go open their own soba-noodles restaurants. 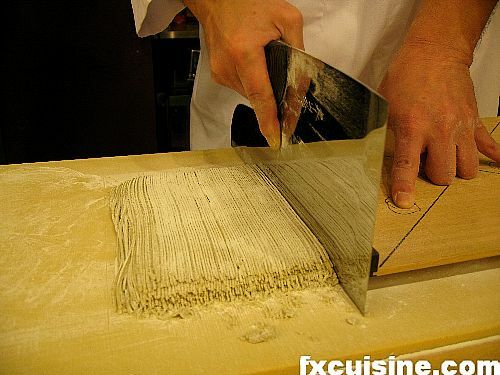 Only about 20% of soba restaurants make their noodles entirely by hand like you will see here. Even I could taste the difference with machine made or even, God forbids, bought soba noodles. The owner is Akila Inouye, a Japanese chef who glows with love of cooking and food. A very nice man, in 3 hours he demonstrated how to make soba by hand and had us make a complete batch each. Mr Inouye's English was terrific and very precise with some deliberate neologisms such as 'You are very good sobatician'. The traditional Tokyo-style soba noodles have a ratio of 8 parts buckwheat to 2 parts wheat flour, called Nihachi Soba (2-to-8 soba). 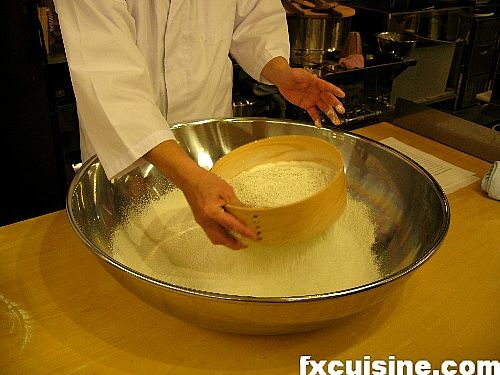 You start with the flours in two bowls and three bowls of water for a total of 50% of the flour's weight. 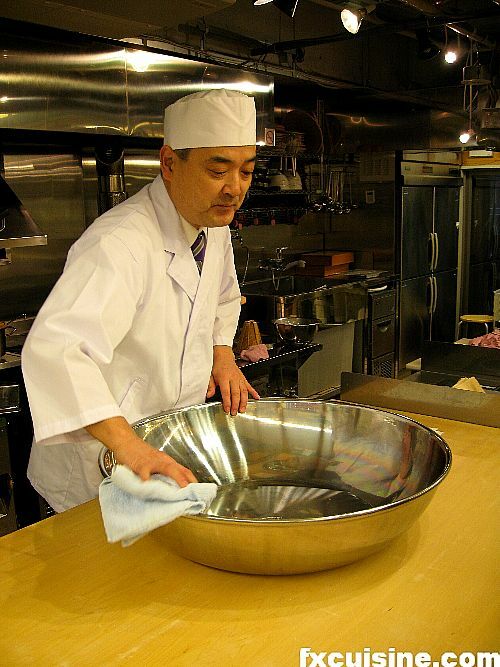 We asked chef Inouye what he thought of the beautiful traditional wooden mixing bowl, which I saw in a soba chef shop for €300 a piece. He just made a sign with his head and one of his two helpers literally jumped in the back to bring him a wooden bowl. He really commands much respect with his pupils - very impressive! He thinks stainless steel bowls are just as good and much less costly. Both flours are sifted in the mixing bowl. Then you pass your hands on the surface to break it and make it more welcoming to the water. You wouldn't want a pool forming in there. You add the water gradually until the right consistence is achieved. Unlike what, buckwheat is very fond of water and drinks it readily. 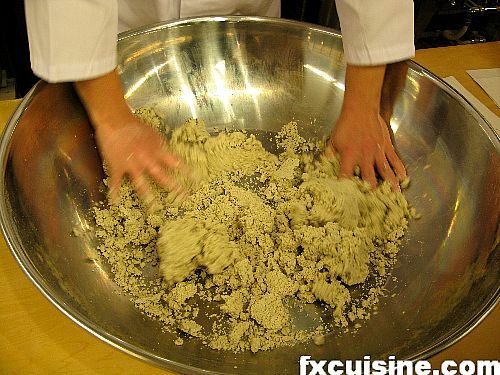 The flour is worked into a ball using highly codified, super efficient gestures. Then the ball's creases are all brought on the top and it is flattened until the entire surface is smooth. This is much smarter and efficient than the way pasta is done in Italy. 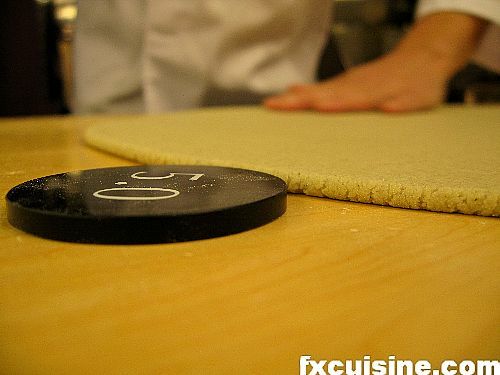 The dough is gradually flattened with the long rolling pin, rotating it by 30° each time for two complete circles. The dough needs to be exactly 5mm thick, which the chef checks with a special plastic gauge (you bet I bought him a set!). This part is where the Japanese beat the Italian when it comes to pasta technique (the Italians catch back later with the sauces). 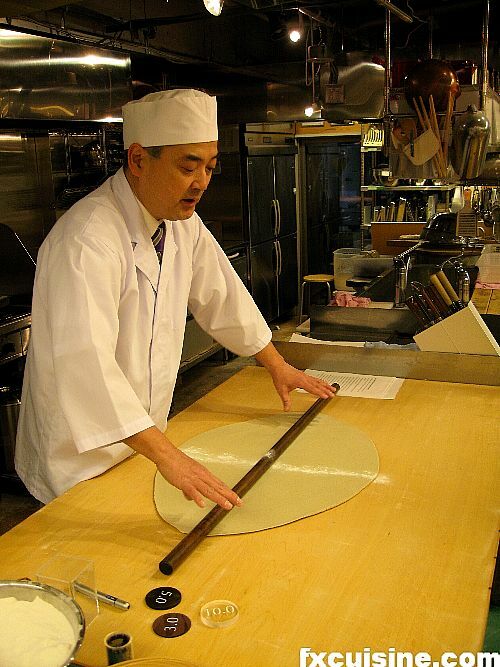 Using a precise technique, the chef transforms a wide circle into a clean rectangle in a series of smooth gestures condoned by tradition. Now the circle looks like an oval. It is turned 90° and again rolled around a longer rolling pin, then extended with pressure applied with both hands in the center to stretch the dough diagonally. 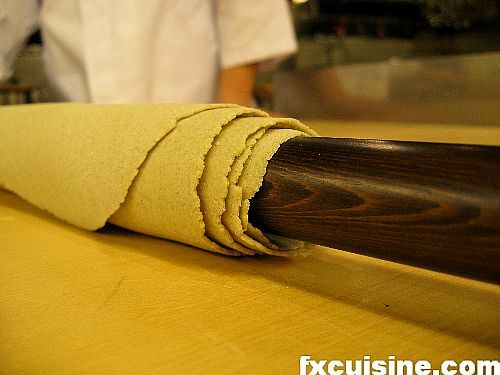 Using the short rolling pin, the dough undergoes further flattening until it is nicely rectangular in shape. I cannot stress enough how superior a rectangular shape is when making most pasta. You reduce your waste by at least 20%. Chef Inuye continues to work his dough until it is 1.5mm thick (check the yellow gauge on the left). The dough is so large now that he needs to roll half of it around one of the two long sticks while he works on the other half.